The National Music Museum (NMM) will close its doors to the public on Oct. 7, in order to prepare for upcoming expansions. The construction will officially begin in June 2019 and is planned to be completed in Dec. 2020. The expansion will include additional gallery space, a permanent temporary exhibit gallery, a new concert hall, additional office spaces and classrooms. The construction will also include modernization of current exhibits and create an ADA accessible front entrance. Patricia Bornhofen, the museum’s manager of communications, said the expansion will allow the NMM to feature more of their collection, something they have needed for a long time. The NMM building was originally a Carnegie library building that was used as the university’s library. In 1973, when the library moved to the current I.D. Weeks building, the instrument collection of Arnie Larson, a USD professor who collected “sounds,” was able to be housed in the space. Since then, the building has had many expansions, including the upcoming additions. Bornhofen said because the original intent of the building was not meant to be a museum, the building needs alterations to make it a functioning storage place for priceless instruments. Larry Schou, dean of the college of fine arts, said in an email interview with The Volante that the current facility does not reflect the quality of the collection of instruments inside. He said the new facility will attract more visitors. Bornhofen said she hopes the expansion will attract more student and local visitors. Bornhofen said the funding for the architectural aspect of the expansion has reached $9.5 million. The museum is now entering another phase of fundraising to focus on the internal design of the exhibits and aesthetics of the building, Bornhofen said. Bornhofen said the museum will still be active before the construction begins in 2019, although its doors will be closed to the public. During the construction, the instruments will be housed in a specialized storage facility and preservation center, be borrowed to other museums around the country, or be displayed in pop-up exhibits throughout Vermillion. Schou said the re-location of the instruments is a way to encourage visitors to visit the museum once it reopens. “This is an exciting time to have more NMM instruments going out to locations to attract attention and eventually bring more people to campus after 2020,” he said. 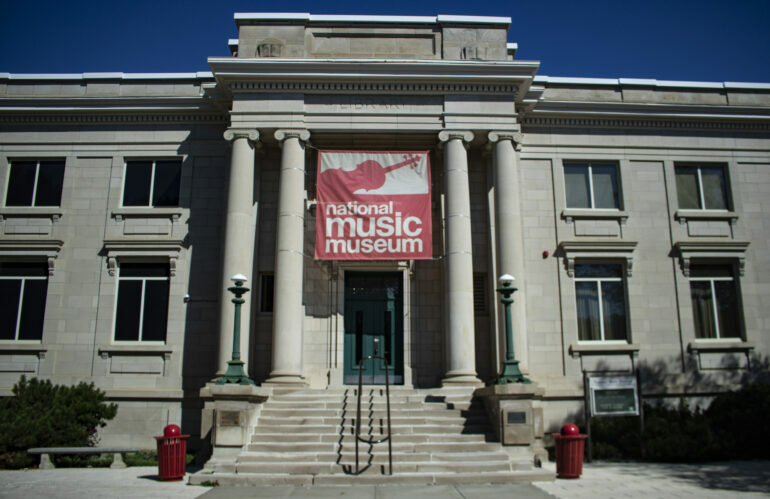 Bornhofen said the museum will also continue to interact with potential visitors throughout the closing by increasing social media outreach and continuing the host NMM live shows and concerts, which will now take place in Farber Hall. Kacie Cox, a sophomore music education and clarinet performance major, worked at the NMM last semester. She said she will be sad to see the museum closed to the public, although she said the expansions are necessary. Bornhofen said students of all majors should make sure to visit the museum before it closes. Video by Travis Cownie courtesy of Coyote News.